The relationship we share with our customers is built on trust and mutual respect. 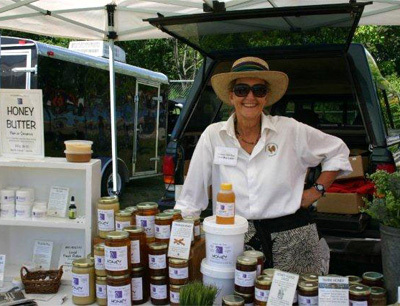 Our customers rely on us to provide them with the best local honey and handmade products we can create. They expect fairness in price and consistent availability. In turn, we count on our customers to give us feedback about our products and the satisfaction and rewards that a growing relationship provides. Every Saturday from 8:00 a.m to noon year 'round. To all our loyal customers - we want to let you know that as of May 1, 2014, Adam Ritchie (Adam's Honey) will be selling honey at the Barrie market in place of Lavender Hills. For the next year, Adam and Tom will be working together with the hives as Adam expands his knowlege of beekeeping. We encourage you to support this young beekeeper and thank you all for your past support and friendships. Every Saturday year 'round 8:00 a.m. - 1:00 p.m. Opening Day is May 3, 2014. Grand Opening is May 17th. Join us for horse & wagon rides, pancake breakfast, firetruck displays and more. Check out Events on OFFM website. Come out and see Tom the Beekeeper and his live bees in the observation hive during the summer months! "Like" the Orillia Fairgrounds Farmers' Market on Facebook!